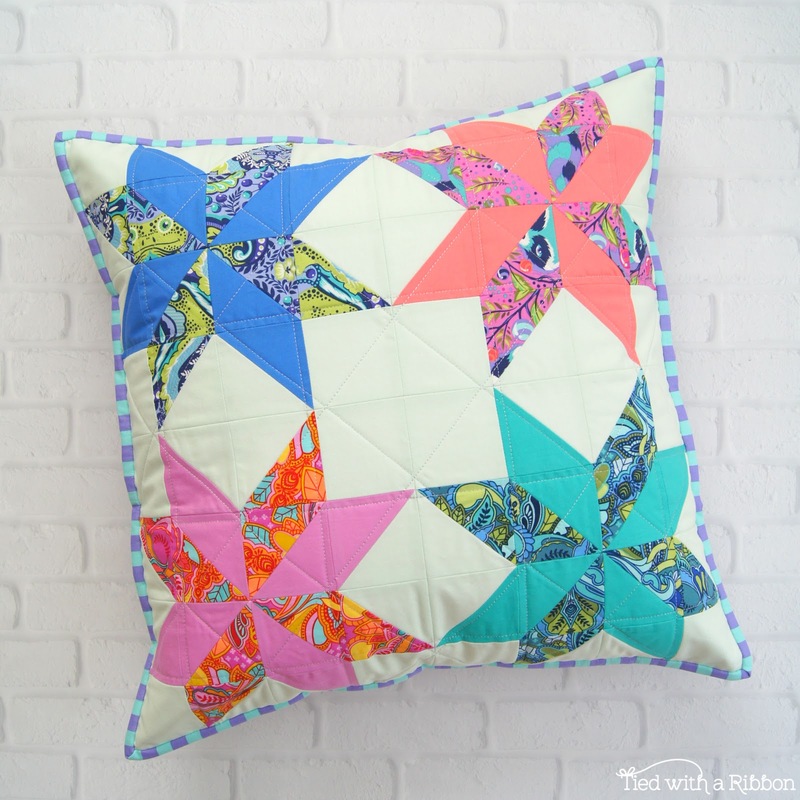 I think it safe to say that with each Tula Pink collection - the designs and colours get better and better - well - meet "All Stars". Hands down my favourite collection to date. 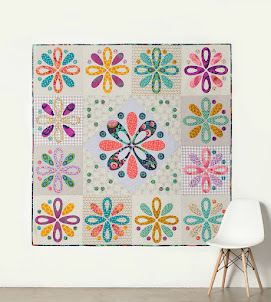 Tula Pink All Stars features some of Tula's favourite prints - not just re-printed but these have been re-coloured and given a new feel to make a whole collection of all your past favourites. 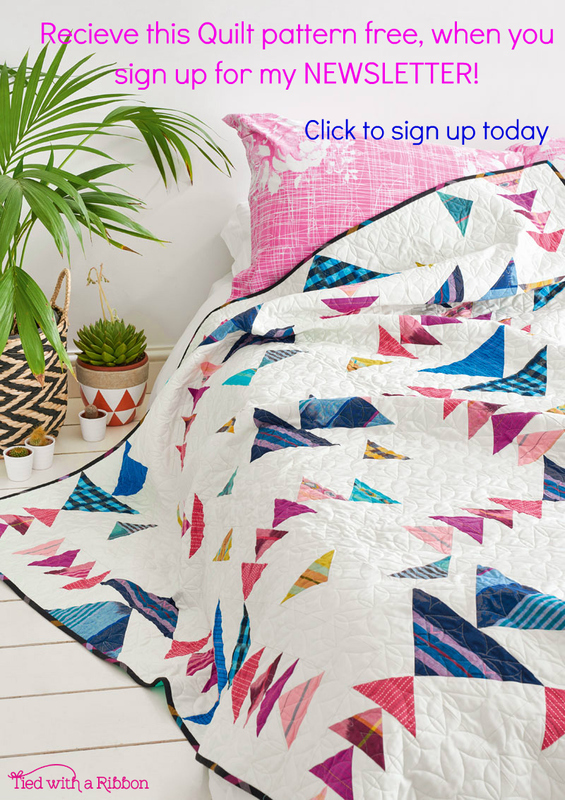 Along with gorgeous focal prints - "Stripes" and "Pom Poms" along with "Tula Pink Solids" round out this amazing range. 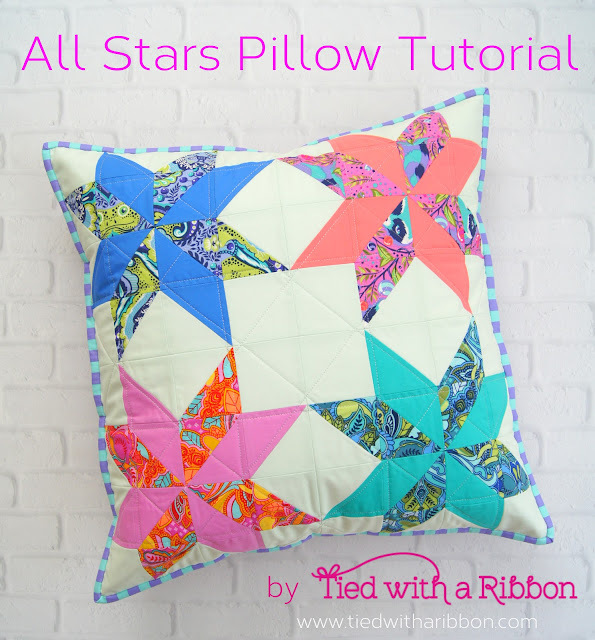 Here is a fun cushion to make to brighten up any spot - a chair, a bed or a reading nook Take your favourite prints and solids and get making with this fun and bright Tutorial for you to make your own "All Stars Pillow"
Step 1 - Cut Fabrics as per cutting instructions. 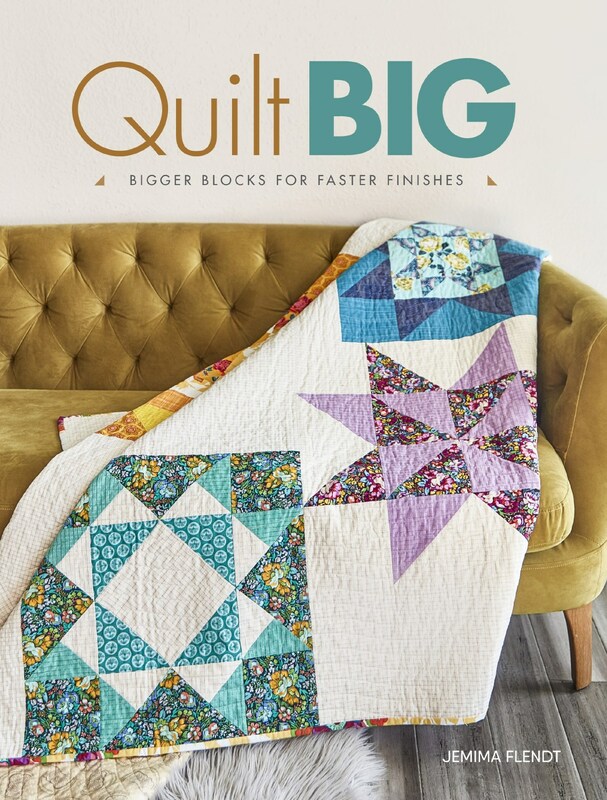 Step 2 - To make 1 Star Block you will need the following – 4 Background fabric 3in squares, 4 Background fabric 3½in squares, 4 – 3½in fabrics squares from 1 print and 4 – 3½in fabrics from a solid fabric. Step 3 - To make the centre pinwheel block - draw a diagonal line from corner to corner on the wrong side of 2 of the same 3.5in square prints using your erasable marker. 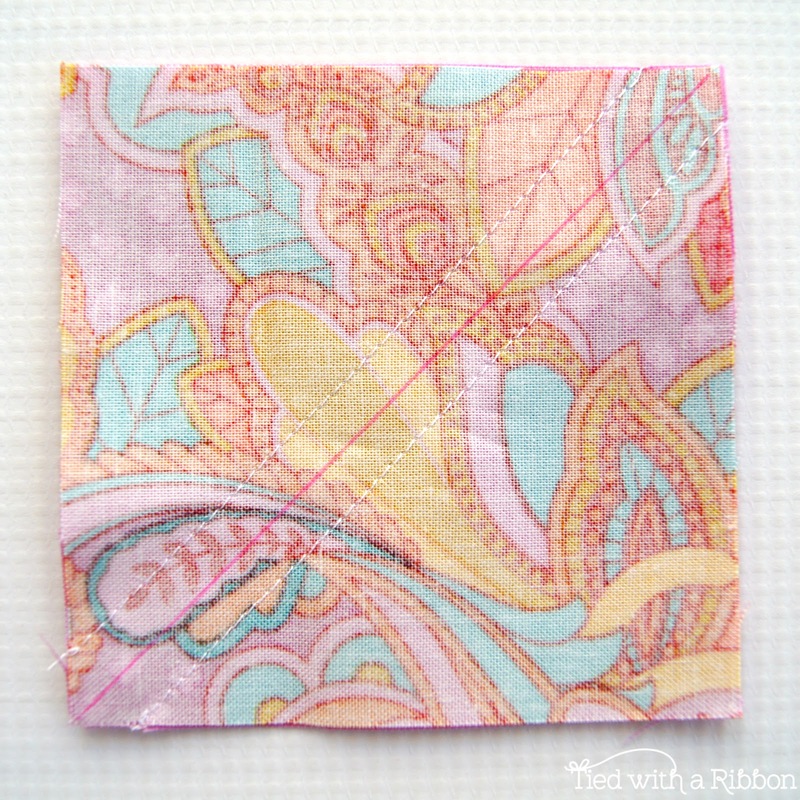 Place a marked square on top of the solid print with right sides together. Pin to hold. Sew down each side of the marked line using a ¼in seam. 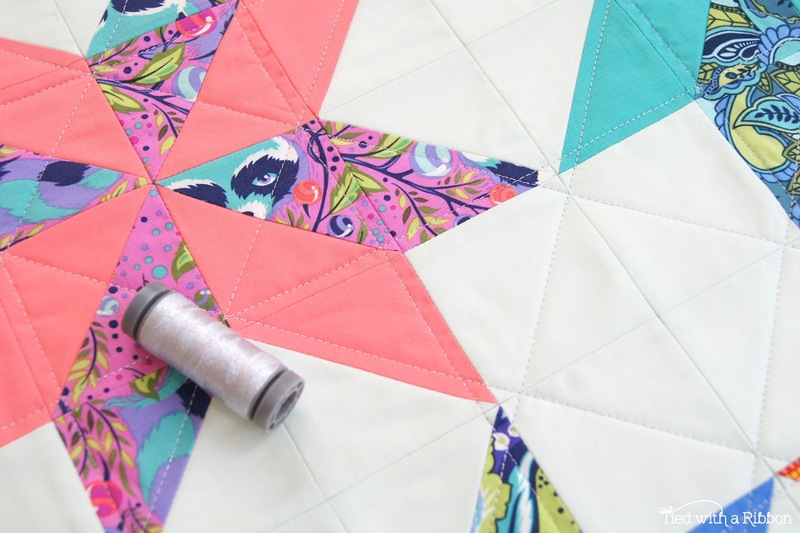 Cut through the diagonal of the square on the marked line and press seam towards the darker fabric. 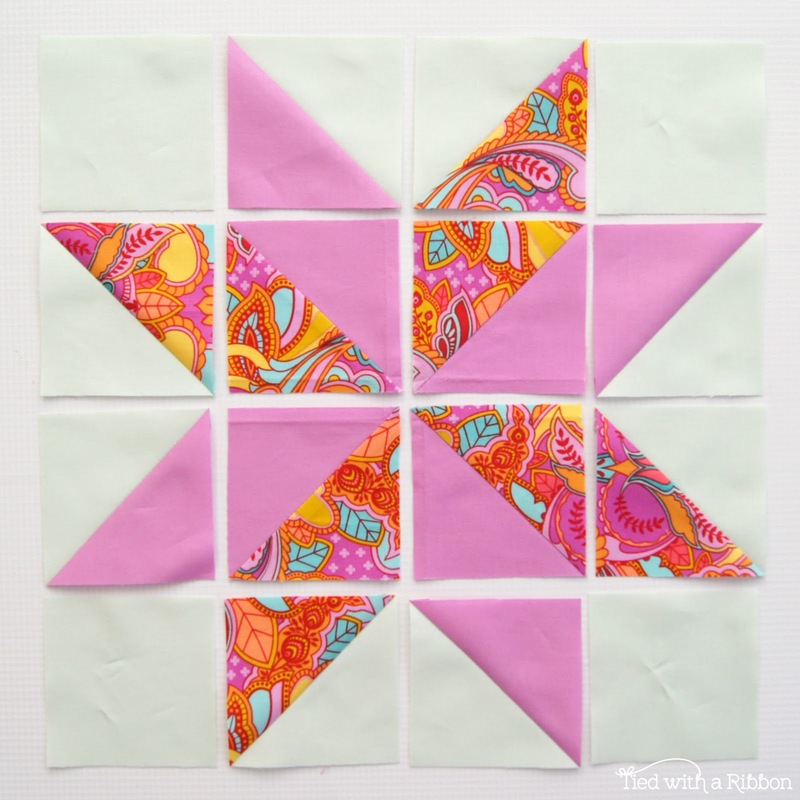 Repeat for the other pair of squares. 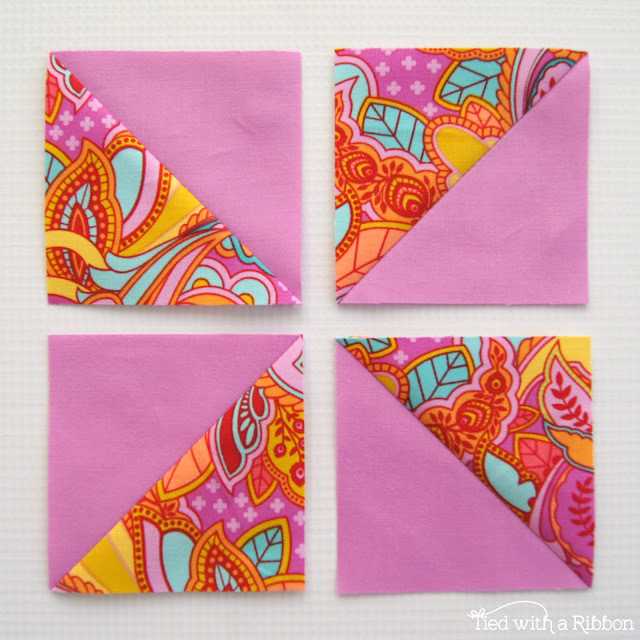 Step 4 - Trim these squares to 3in. 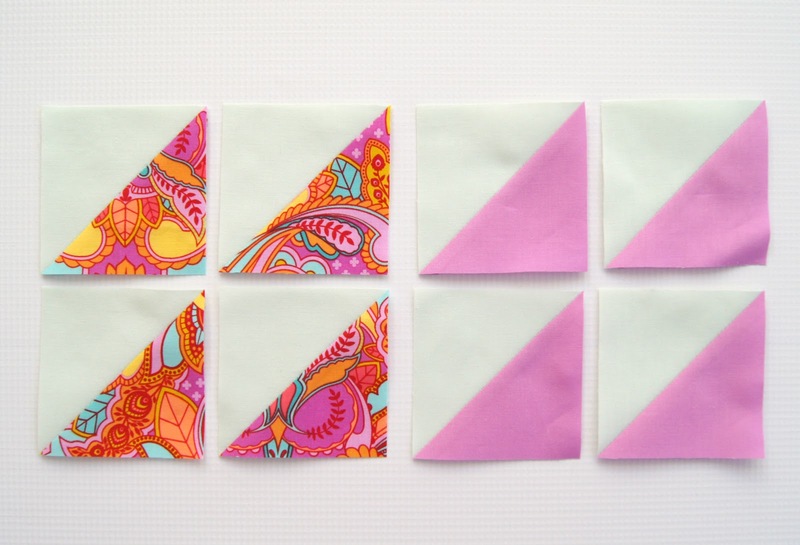 This will make 4 HST (Half Square Triangles) units in total. Step 5 - To make the outside star points – take the 2 remaining squares from print 1, the 2 remaining squares from the solid print and the 4 – 3½in Background fabric squares. 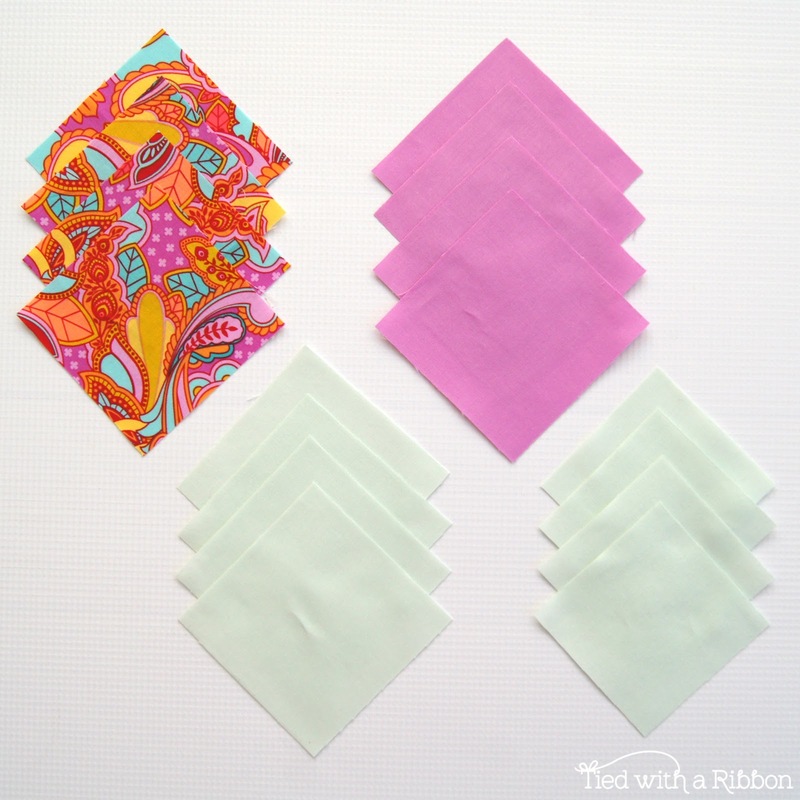 Draw a diagonal line from corner to corner on each of the fabric prints. Pair each up with a Background fabric square and pin to hold. 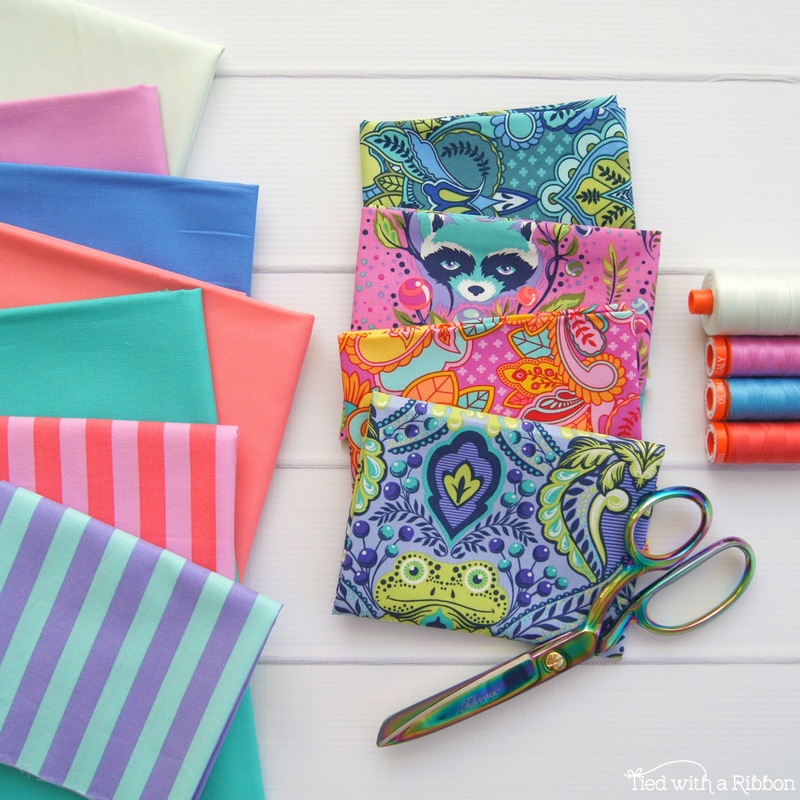 Sew down each side of the marked line using a ¼in seam. 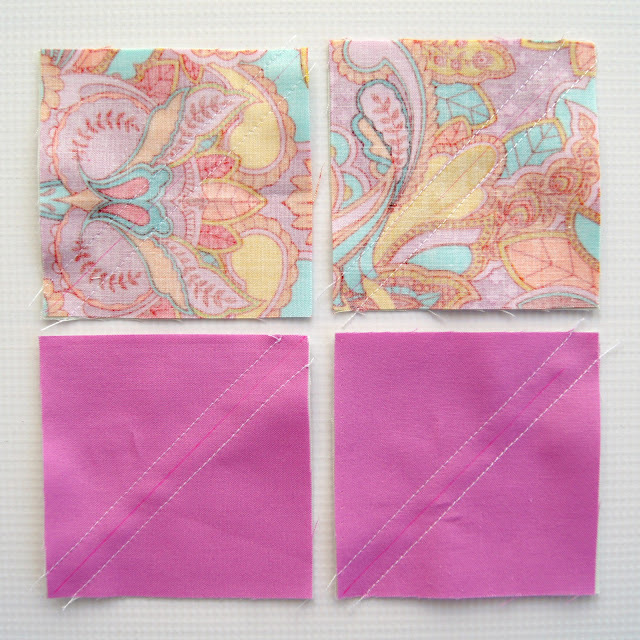 Step 6 - Cut through the diagonal of the square on the marked line and press seam towards the darker fabric. Repeat for the other 3 squares. This will make 8 – HST units in total. 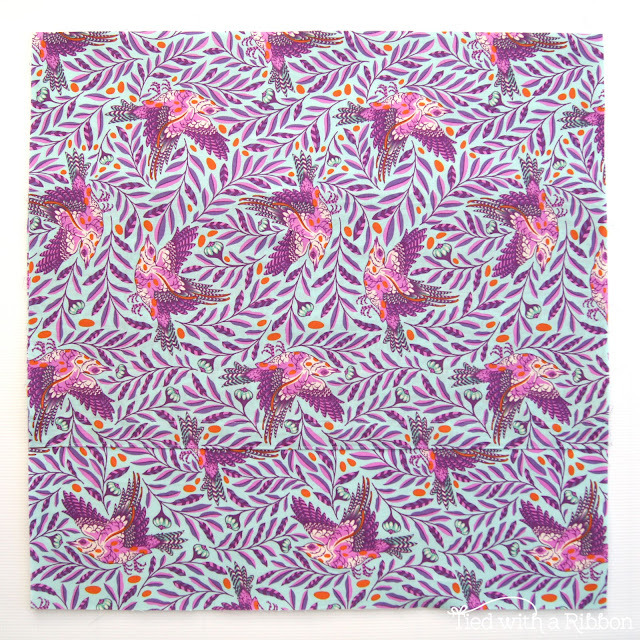 Row 1 – Background fabric 3in square, Solid/ Background fabric HST, Background fabric /Print HST, Background fabric 3in square. 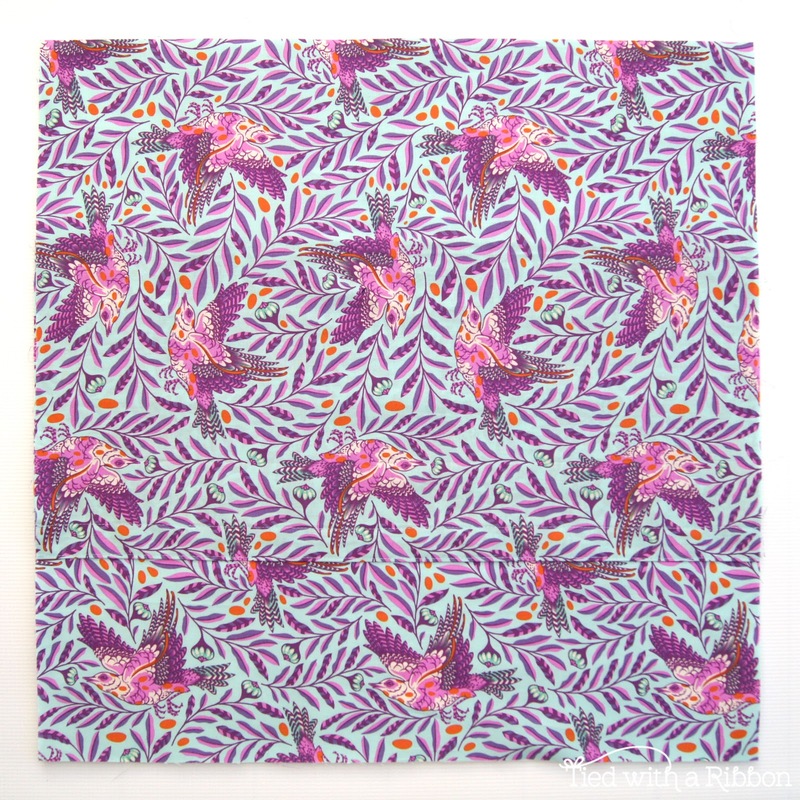 Row 4 - Background fabric 3in square, Print/ Background fabric HST, Background fabric/Solid HST, Background fabric 3in square. Arrange the star so that the same colour print matches up at the points. 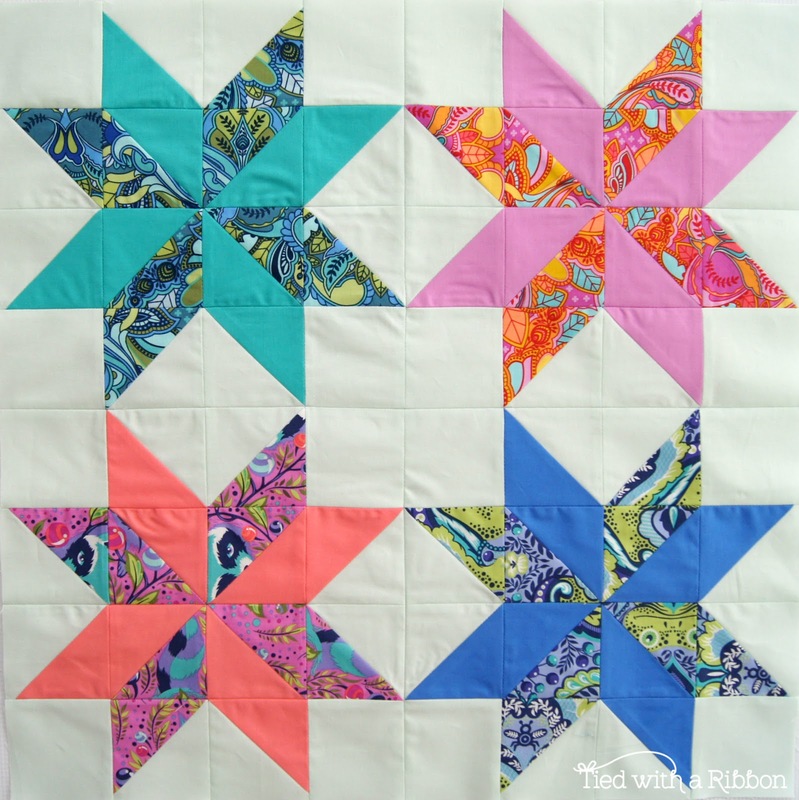 Step 9 - Repeat steps 2-8 to make a total of 4 star blocks. Sew up the squares of your pillow by sewing each of the 2 Blocks together the make a row. Press the seams in the same direction. Sew each of the rows together pressing alternate rows in the same direction. 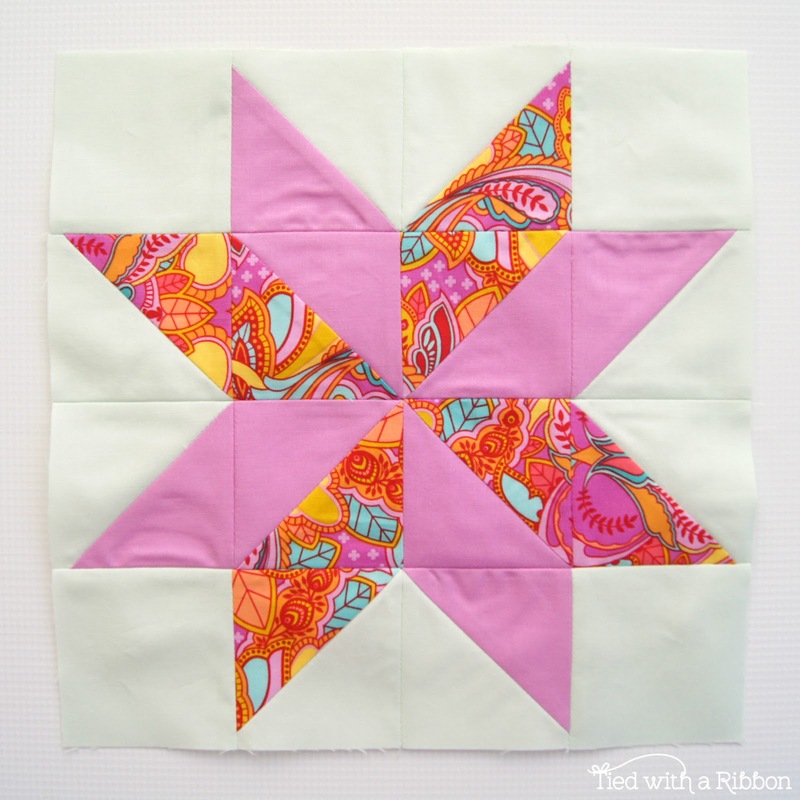 Step 10 - Baste and Quilt your Pillow top – centre the pillow top over the batting, pin to baste then Machine quilt your pillow top. Trim Batting to size. 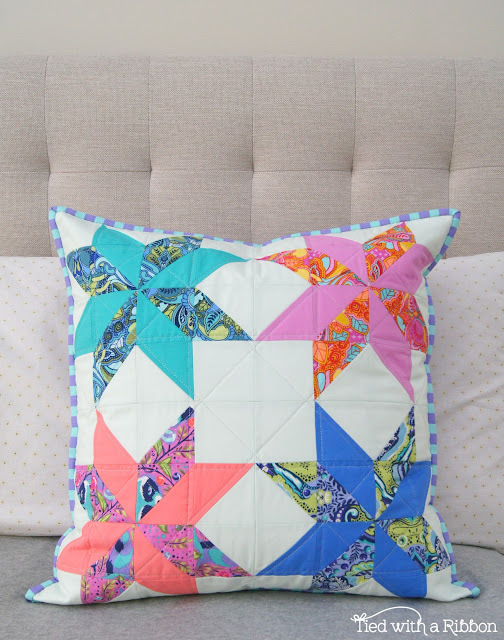 I used Aurifil Brillo #800 to quilt my pillow top. Step 10 - To make the Envelope Back – take the backing rectangles, fold down the backing fabric ½in down from the 20½in end. Press in place. Now turn over and pin this folded edge down 1in, pin and press in place. 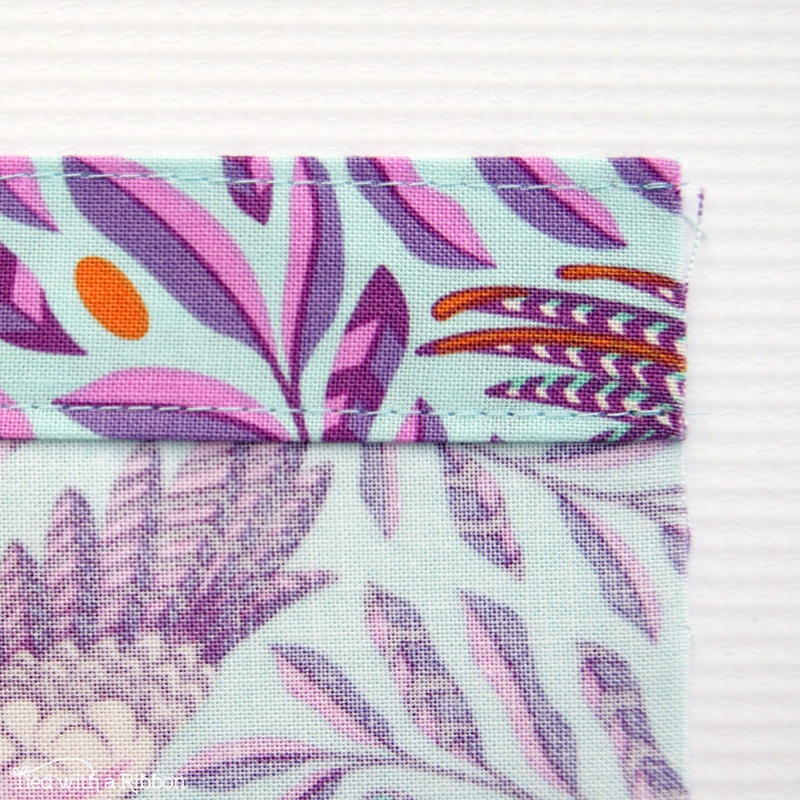 Machine stitch down both the folded edges to hold in place. Repeat this for the second backing piece. Take your completed cushion top and the completed back envelope panels. Place the Front of your cushion down onto the bench (so you can see the wadding), place your first back panel on top of the wadding facing you, matching the raw edges of the side of your cushion front and the raw short edge of your backing. 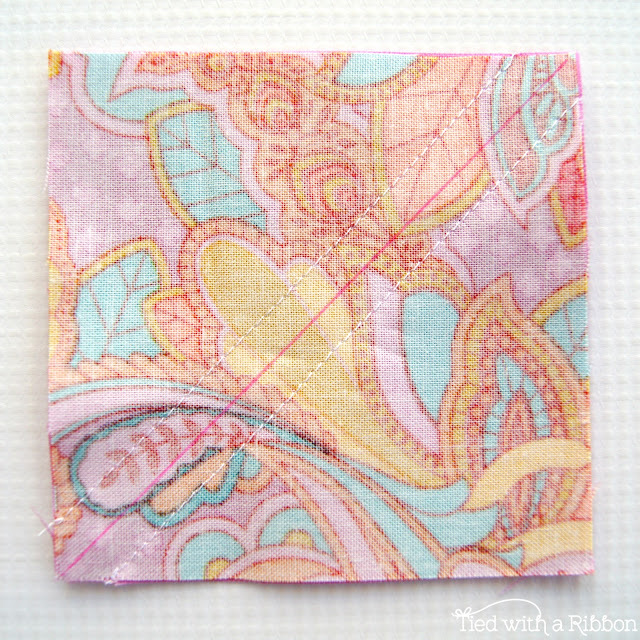 Then lay your second backing piece down along the opposite raw edge also so that the right side is facing you. Pin around the outside edges and sew these three layers together by sewing just in from the raw edges to hold in place to make it easier to sew on your binding. Step 11 - Take the binding strips and join them end to end. Press the seam open. Then press the entire strip in half lengthways with wrong sides facing. Start about half of the way along one side of the pillow, sew the binding strip to the right side of the pillow, mitring the corners as you go. Stop about 6in from where you started. Join the ends and cut off excess. Continue sewing the binding to the pillow top. 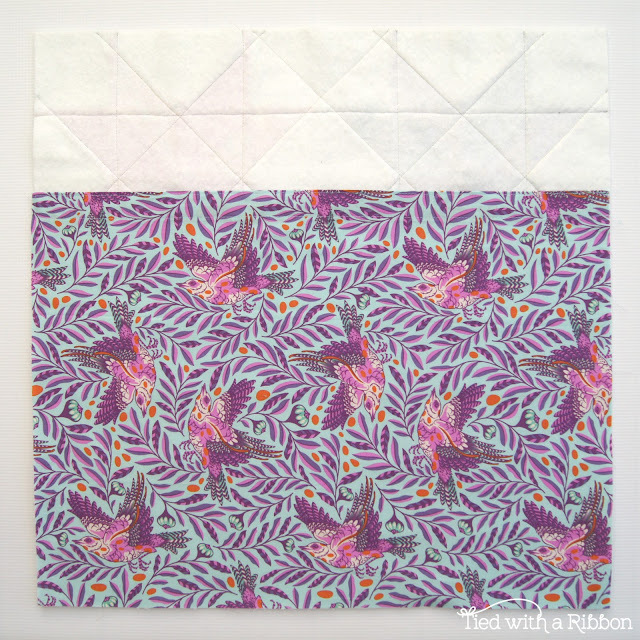 Fold over the binding and slip stitch into place along the back-seam line.